Issue: The large 4x8 wood sheet unit (NE corner) needs to be relocated (for obvious reasons) because it is adjacent to the heavy metal shop. First step: In anticipation of this, I have completed the following (see below). (1) in the NW corner, next to the 3 phase panel (where the big floating table is presently parked). 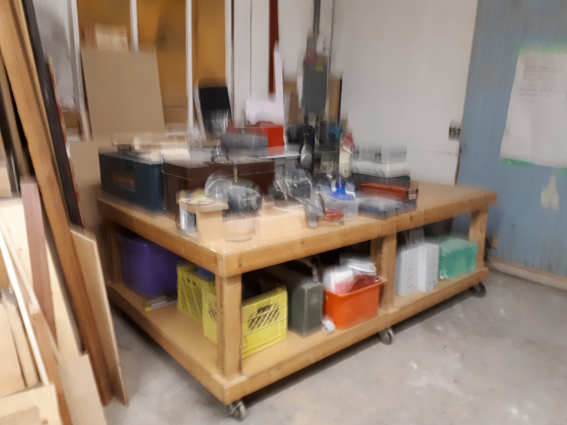 (2) in the SE corner of the wood shop, just inside the big sliding door, where the old poison cabinet currently resides. Over the last few days and tonight I cleaned the NW corner (left of big doors) and the big floating table (also cleaned, top and lower deck). Lumber found scattered around is leant-up behind the big floating table with the junk wood toward the back. Various lengths of 2x4 lumber under the orange shelving (far end). There are also two boxes of wood (presumably someone’s project) at the end of the table. Things on the lower deck were put back, some misc electrical cable in a brown plastic box. Also found two conduits (one labeled @Dmo); two florescent tubes; and, a stirrup pump laid together down centre. This left the entire top deck and half the bottom deck clear. The table was then floated alongside the yellow scaffolding and the contents shifted onto the big floating table - with help from others … and returned to the back corner. Big floating table, back at home base, with contents of what had been on the yellow scaffolding shelving added. Then the yellow scaffolding was rolled N so that the far end lined up with the S (right) side of the opening to the heavy metal shop. … and the shelves flipped around so that they now overhang on the right, vice on the left (as before). This is where I stopped, with the yellow scaffolding still unloaded. Yellow scaffold shelving after clearing, cleaning, rolling and flipping the shelves around. I understand that we will need to use the yellow scaffolding as, well, scaffolding in the next month or two. However, after that we could return it to short term project storage as before (w parking tickets or whatever the tidy space group decides). 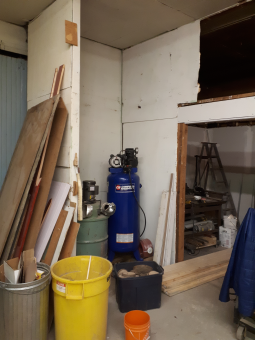 It has been decided that the 8x4 storage in the back NE corner, next to the heavy metal shop, has to be moved in order to eliminate combustible materials from the immediate vicinity of the heavy metal shop. (A) the big floating table would not be displaced from its current cosy home base. (B) the sheet wood would not only be far from the heavy metal shop, but also away from exterior walls, minimizing risk from water damage. (3) increase clearance below bottom shelf to accommodate parking space for wheeled machines such as the jointer, possibly metal band saws. (1) this would require to also either cut down the shelving on the yellow scaffolding shelving; OR, make new shelving cut to fit the length of the yellow scaffolding shelving unit. 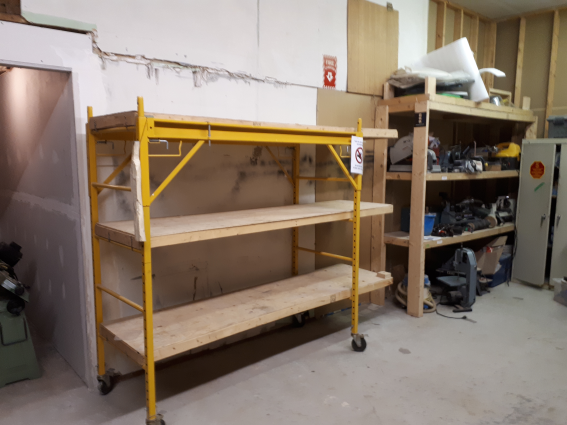 Since we probably need to keep the current scaffolding decks for when actually needed for use as scaffolding, we probably should make new shelving for when in use as short term project storage. 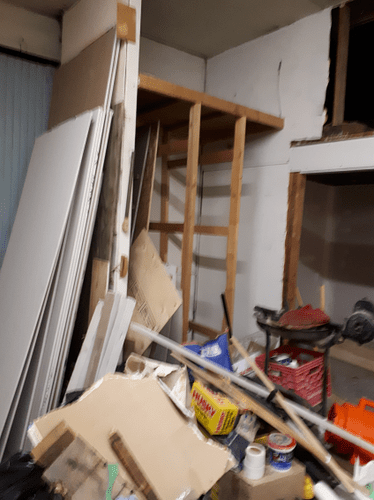 (2) optionally, we could add “doors” to the reassembled wood shelving… not because we need doors, but rather because they could be valuable storage for hand tools (both inside and outside). The door panel could be, for example, ½’ plywood, with a frame around of, say, 8" wide ¾" thick planks on edge, so that the doors would actually be 8" deep, with the panel fixed mid-way. This would provide vertical storage space on both sides of each door, just under 4" deep. Or, use 10’ or even 12" wide planks for deeper pocket space. To support the weight, heavy hinges would be needed, plus roller casters under the outside corners of the doors (possibly sprung, to accommodate uneven floor or litter on the floor). I think we’re all largely in agreement with (2) in the SE corner of the wood shop Does anyone have an issue with that? I agree with the (1) approximately 18" shorter so as to fit. As for (2) 24" deeper, I think we could make it a bit deeper, but I worry that might make it too deep, and items in the back would be hard to reach for smaller people. Do we know how much taller we’d need to make the lower shelf to accommodate the jointer underneath it? Maybe 24" deeper is a bit much, we should do some experiments to determine the appropriate depth (as well as look at equipment such as the small wood lathes that could potentially be stored end-on or at an angle for ease of access, rather than laterally, one in front of another, as is the case now. Last night, @Reuben @Enquire and I did some more work on the Wood shop rotation. 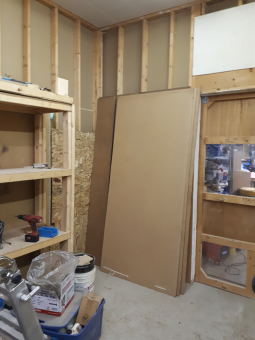 The main tool shelving has been moved over and we started work on the sheet material storage space. The tools are temporarily back on the yellow scaffold shelving. We put up some backing to protect the backside of the dry wall in the machine shop. We still need to put up some backing along the right hand side as well. We’ve identified some pieces that will possibly work in that area, and left them up against the wall there to be cut to fit into place next time. This corner is about 5’ deep (1.5 m) deep and about 42" (1.07 m) wide and we intend to split it into two sections of (up to) about 18" (0.45 m) wide after framing. Currently, we are screwing MDF board to the naked wood studs at the back and side. We are looking to install a smooth base to mitigate damage to bottom edge of sheets … a piece of Arborite (maybe salvage from old kitchen counter top) or some other surface might be suitable. Meanwhile, we are curious what will happen to the remaining stud wall at the left side of the old storage. Will this be used to enclose the big blue compressor (sound insulation, perhaps), or could it be used for the sheet wood storage?